Happy Monday, Friends! I hope you had a lovely weekend! Guess what I did over the weekend? If you guessed I installed another chandelier, that would be a fun guess. Sadly, that is not the case. The project was a bit more mundane. I painted our mailbox and post! Come see! I am in total agreement. The mailbox is indeed faded and tired looking. Painting the mailbox is something I planned on doing anyway, but now I need to do it in less than 30 days or risk being in violation of our governing documents. And I am a compliance type of gal. So, I whipped out my tools and set to work. Here is the offending mailbox before. Isn’t the bird poop a nice touch? First I took off the flag which is simply attached with a single philips head screw. The flag was originally red but faded to an unattractive shade of pink. I then decided while I’m repainting the mailbox, the flag could use a little facelift too. So, I painted both sides of the flag metallic gold. Although the flag is plastic (and I vehemently dislike almost anything plastic) it looks better painted gold. It gives it an air of importance. Now the flag can pretend like it’s metal. The numbers are also faded and I needed to paint the space behind them, so I scraped them off with a flat razor. I wiped down the sticky area with some Goof Off. I bought new numeric stickers on Amazon for around $10. (see below for product links) I chose gold because the old numbers were gold and the flag is now gold. 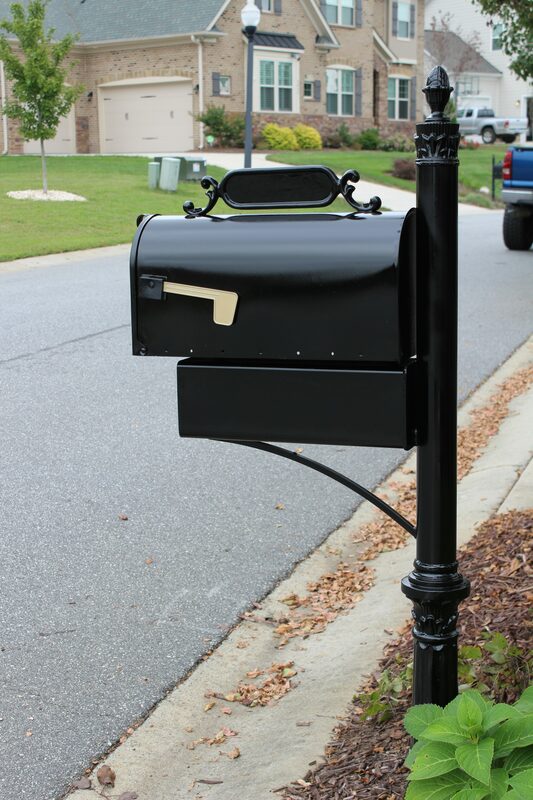 Black and gold are two of my favorite color combos so I knew it would look sharp on the mailbox too. These are the numbers I chose. I thought the numbers peeled off but they are printed on a black, rectangular background. It works. After removing the flag, I wiped off the bird guano and cleaned the entire mailbox and post. I chose a black gloss spray paint by Rust-Oleum. The post was originally painted in a semi-gloss but I thought it would look shiny and new in a glossier finish. I spray painted several light coats of paint and allowed it to dry. You can see the side by side comparisons of the faded paint and the newly painted glossy black finish. Much improved! I reattached the gold flag and it’s good as new! The numbers arrived today and they are now in place. The box and post look brand new! Now all we need is a flowery climber such as a Clematis or Mandevilla and the mailbox transformation will be complete! Thank you to our HOA. It was just the kick in the pants I needed to get this project completed! Once the weather cools off a bit more we have lots of yard work to do. I can’t wait to buy some plants, flowers and mulch and bring the yard back to its former glory. P.S. Here are a few more before and after pictures. Isn’t it amazing what a difference a little paint can make? Items for use with this project can be ordered here. Just click on the link below for the item you choose.